There are 3 components that make the tanning process work: UVB, UVA, and oxygen. When UV light shines down on the skin, the UVB starts the tanning process by stimulating melanocytes – pigment-making cells found at the base of the epidermis, causing the melanocyte cells to produce melanosomes, which contain melanin – the protein that turns brown and gives your skin its tan. When UVA shines down on the skin it darkens the melanin that has been produced, and oxygen coming from the blood stream is required for UVA to complete its job, darkening the pinkish melanin and turning it brown, which is why good blood circulation is important for your tan. People choose to tan for psychological and physiological reasons. Most seek the cosmetic value of a darker skin as a way to heighten mood and self-esteem. Others tan to help their body produce Vitamin D. Vitamin D production is one of the benefits that has been associated with human exposure to ultraviolet-B (UVB) emitted in sunlight and by an estimated 90 percent of commercial indoor tanning equipment. Vitamin D is known as “The Sunshine Vitamin” because exposing our skin to the sun is the most abundant source of vitamin D production. One typical non-burning tanning session can produce as much vitamin D as 200 glasses of milk (20,000 IU), which is why indoor tanners have among the highest vitamin D levels, about 90% higher than the general population. Tanning is the body’s natural response to ultraviolet light, and nature’s design to protect your skin from a sunburn. Tanned skin is several times more resistant to sunburn, and a tanning bed is a controlled way to get that protection. That’s why millions of tanners visit professional tanning salons before taking sun-filled vacations. Tanning beds are designed to replicate UVA and UVB produced by the sun in carefully controlled combinations. This allows trained operators to control clients’ exposure and provide them with a great tan in moderation, while minimizing the risk of sunburn. The strength and amount of UV light emitted by the sun varies from day to day, increasing the risk of sunburn. 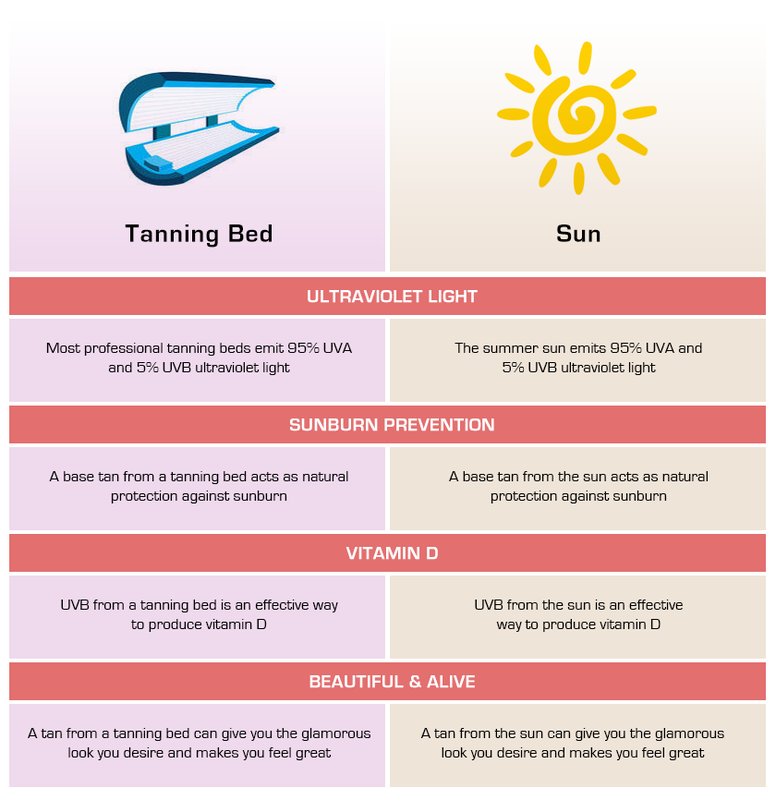 The biggest difference between the sun and tanning beds is that the sun also produces UVC which is the most harmful ray, where as tanning beds will filter out UVC rays, so that a tanner is only getting UVB AND UVA rays. Exposure to UV light not only makes you look great, it also makes you feel great. By looking great you naturally feel better about yourself. But sunlight exposure can also lift our spirits in ways that go beyond a beautiful tan. For more information on Tanning and Vitamin D, please visit the links below.